The University Centers Advisory Board unanimously voted not to renew Round Table Pizza’s lease on May 3. The restaurant’s lease is set to expire on June 30, 2017. In a public statement, UCAB identified lukewarm student reception, “lower sales, food quality, low use of the dining space, and emerging student interests and food trends” as reasons leading to the resolution. The data came from various student surveys and secret shopper data. UCAB Vice Chair Luke Wang highlighted that many details were considered in the decision-making process, but not all of them could be disclosed to the public. UCAB Chair Claire Maniti described this year as the best time to end Round Table Pizza’s lease because there would be no overlap with the closure of another alcohol-providing business. Once Round Table Pizza closes, students will be able to shift their patronage to the new establishment that will be replacing Porter’s Pub. Donna Buhl, the owner of the Round Table Pizza at Price Center, attributed the low sales numbers to her decision to make pizza more affordable for students. Buhl expressed her frustration with certain restrictions that prevented her from using outdoor freestanding signs for advertising. 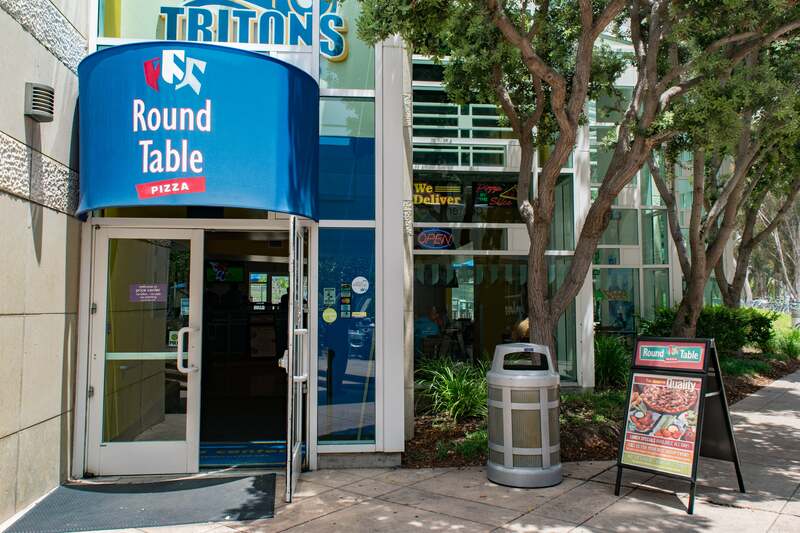 Some UCSD students showed their support of Round Table Pizza by signing an online petition urging UCAB to reconsider its decision. Revelle College senior Alex O’Connor shared that he often goes to Round Table Pizza for its low-priced deals and so he can watch televised sporting events. Wang clarified, however, that although Round Table Pizza is often given praise for the television displays, the displays are actually made possible by University Centers. Given the sports broadcasts’ popularity among students, a similar setup may be in place with the new vendor. Buhl stated that she will continue to manage Round Table with the same level of generosity she has always provided. Maniti disclosed that UCAB will select a new vendor for the space by Winter Quarter 2017, following the request for proposals process. As of now, there is no concept in place for what will replace Round Table Pizza. Here comes Little Caesars, brought to you by Janet ‘Gimmeanothervodkastat’ Napolitano. Put in ice cream sandwiches!